Fairly new at Munich in 2014: one of the rare borates found in the occasionally prolific Kohnstein quarry. 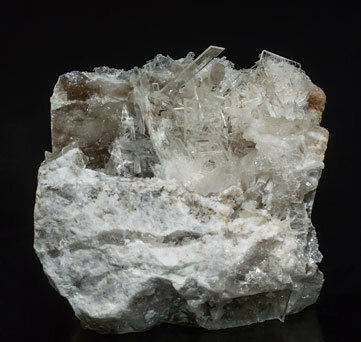 The crystals are extraordinarily sharp, lustrous, colorless, completely transparent and very large for the species, and they are on matrix. Though reluctant to make value judgments, we have to say that this specimen is probably among the best for the species from any locality.